It is amazing that after all these years, alarm clock has not seen any innovations being done. The only except is what I called the wake up lights: a relatively different way of telling you to wake up. It is fairly popular in European countries but I have not seen much interest in the US yet. If you are looking for one, the following is what I considered to be the best wake up lights for 2015. Wake up light is such a new thing that I better take the time to explain what it is. In simple terms, it a combination of light and sound therapy to wake up naturally, rather than abrupt alarm noise that we are all used to. According to research, such a wake up method will leave us more ready to face the day than a sudden waking up experience. Due to such an experience, wake up lights are also sometimes called Dawn Simulator or Alarm Clock Light. Hands down, this is one of the top rated and best wake up lights for 2015. The Philips HF3520 has won so many positive review that it isn’t difficult to pick this as our top choice. It is choke full of sensible and useful functions that I wondered why traditional alarm clocks didn’t have these things earlier! First off, I love the snooze function because I snooze quite frequently. All you need to do is to touch ANY part of the surface and it will snooze for the next 9 minutes. This beats having me to get up, look at the alarm, and then trying to hit the right snooze button LOL. Another cool thing is the different sound setting that you can chose from. I prefer the piano but there are others like wind chimes, birds etc that you can select if piano is not your thing. What I want to stress is that the sound and the light really makes waking up a different experience from the noisy and irritating alarm clock. In the past, I used to wake up feeling irritated because of the sound but now, I feel more calm and relaxed in the morning. 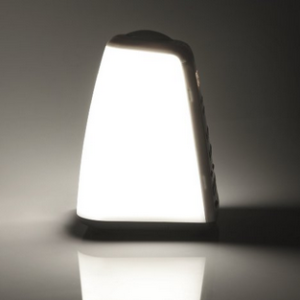 This wake up light can also serve as a reading light at its brightest option. This dual function is highly appreciated as it means I don’t have to find the space to accommodate both a reading light and this wake up light. 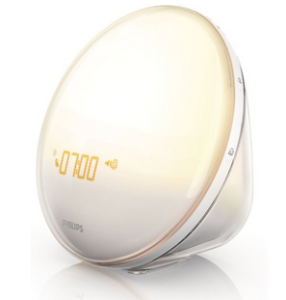 I talk about such dual function appliance in my Dyson pure cool review and this Philips wake up light is another fine example. The light setting itself has many options. Among which is a dawn and dust simulator that gradually brightens or darkens a room. Finally, the durability of the wake up is something that I am impressed with. I have used a Verilux before and it didn’t last as long as this model. In fact, the bulb is a LED so it has a lifespan of 20 years. Talk about value for money! The only thing is the price tag. It is around USD130+ so it might be consider too high for some, given that most just view this as an alarm clock. However, given the 20 year life cycle of the bulb and the fact that it is a better way to wake up, I think the price is worth paying for. In summary, this is a great choice if you are finding a wake up light for the money. Its price tag might not be cheap but its useful feature and high quality makes it head and shoulder above the rest. If you are looking for ca cheaper wake up light, then this model by Sound Oasis will be a good choice. It did not receive as many positive reviews as the Philips HF3250 but it is definitely cheaper by $50 to $60. If you are a budget and still wants a good product, check out what the Sound Oasis wake up system has to offer. One of its more unique selling point relative to the Philips HF3250 is the usage of smell on top of light and sound. The system has an inbuilt Aroma Diffuser that has an option of 4 scents for you to pick. If you are the type that like aromatherapy, this might be ideal for you. In terms of sounds, it offers 6 choices, one more than Philips HF3250. Although the choices are more but the sound control isn’t as good. The Philips model will gradually increase its volume while the Sound Oasis wake up light systems starts off at a much louder volume. The light control is where Philips win outs, although that is not saying the Sound Oasis is bad. It has a dimmer control but the first instance of the lights when the alarm is triggered is too bright for my taste. Also, the clock screen has too strong a yellow that might actually distract you from sleeping when the room is in total darkness. This is an issue that the Philips HF3250 doesn’t have as you have options to control the clock screen lights. Overall, this is still a worthy product especially when in view of its attractive price point. Its strength is in the aromatherapy but I feel there is room for improvement for its sound and light control. I have recommended what I think is the best wake up light for 2015 as well as a cheaper version for those with a budget. If you have other models mind, would love to hear them in the comments.